Mini Rugby players from Oban Lorne, Mid Argyll and Etive Vikings along with hosts Isle of Mull RFC kicked off the 2018/2019 Mini Rugby Dalriada season on Saturday September 1 at Garmony. 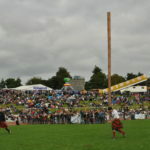 The festival was the first of this season’s Dalriada Festivals that involve rugby clubs throughout Argyll along with Highland visitors Lochaber RFC from Fort William. Saturday’s festival attracted a great turnout of players, parents and supporters with some fantastic rugby on show from all of the teams in attendance. This season mini rugby clubs across the country will be trialling Scottish Rugby’s new law variations that look to promote a faster, more skilful and enjoyable game. The new laws were used in Saturday’s festival with fantastic results given the large number of tries awarded. Mid Argyll RFC hosts the next festival on Saturday September 8 at the Ropework Park in Lochgilphead from 12pm.